Whey protein is a form of protein which contains a good range of essential amino acids, it can be absorbed quickly. Many studies proved that it can help you by increasing strength, gain muscle and lose significant amounts of fat in your body. Whey is more than just a protein. It contains many other important nutrients, some with good biological effects. Whey protein is made from milk and milk contains two type of protein in it, first one is casein protein and the second one is whey protein. If you've ever opened a yogurt container in your house to see liquid floating on top, that’s whey protein. Cheesemaker companies used to take out it before they discovered its commercial value in the market. After the separation in between cheese production, whey protein goes through various processing methods and steps to become what people generally recognize as whey protein powder which comes in good packaging, which you can add in the shakes and protein bars. Whey protein helps to recover in your post workout drink. Raw whey protein is natural to form of whey protein, actually, whey protein which is presented in the market are loaded with many additions substances in there like flavors to make it tasty and many digestive enzymes in it for those people who have lactose intolerance problem, and raw whey protein doesn't contain any flavors or digestive enzymes in it. Raw whey protein's work is as same as the whey protein which comes in many colorful packaging, the difference is all about the taste and the addition multivitamins and vitamins which many brands are giving in there whey protein. If you are thinking that raw whey protein is good for your post workout or your meal replacement? then here is your answer, yes, you can take it as the normal whey protein, because they both are same, the only difference is this that raw whey protein is a natural form of protein with no sugar and no fiber in it, if you have lactose intolerance in your body you can add some digestive enzymes in your body, but it tastes very bad. Proteins are very essential, important and main building blocks of the human body. They're helpful in various important things in your body, including organs and skin, as well as hormones, enzymes, and various molecules. Proteins are also the building blocks of the muscles. They’re made from amino acids, smaller molecules inside the protein that are linked together. Many amino acids are produced in your body by your body's cells, while others are in the food that you eat. The amino acids which you get from foods are termed essential amino acids. Proteins that are loaded with all the nine essential amino acids in it are the best, and whey protein contains all of them. It’s mainly high in branched-chain amino acids (BCAAs) like leucine, valine, and isoleucine. Researches show that leucine is the main anabolic growth promoting amino acid. Whey protein appears to be mainly effective at stimulating growth in humans. In fact, human breast milk is 65% whey, compared to 21% in cow's milk. 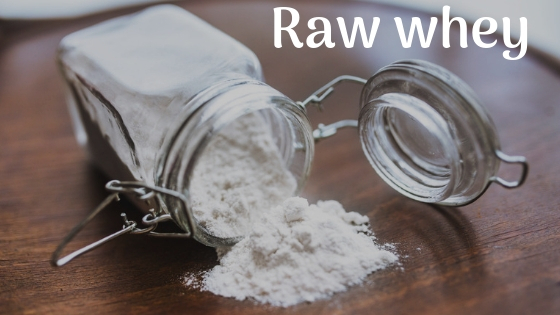 Raw whey protein is 98% same as normal looking whey protein because of the add-on which is presented in the normal whey protein makes it different from raw whey protein otherwise you can take both for the same use as a post-workout recovery because there work is 100% same.